Teflon© coatings allow almost unlimited application. Vinyl coatings offer excellent chemical resistance to acids, alkalies, aqueous salt solutions, alcohols, gasoline, and aliphatic hydrocarbons. 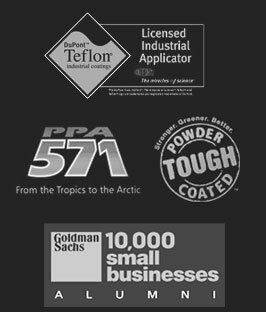 Plastisol applications include the handles of an assortment of tools (pliers, wrenches, specialty tools, etc. ), wheelchair rims, rock cod plates, valve handles, hangers, steering controls, levers, and anchors. Teflon© industrial coatings combine heat resistance with almost total chemical inertness, excellent dielectric stability, and a low coefficient of friction. Powder coating is mainly used for coating of metals, such as household appliances, aluminium extrusions, and automobile and bicycle parts. Your best source for Fluid Bed Vinyl, PVC Coating, Teflon Coating, and Powder coating. Specialists in the custom application of specialty coatings, Denmac Industries offers you complete capability for your coating requirements. Coatings from Denmac Industries can improve appearance and give special characteristics such as anti-stick, chemical and corrosion resistance, dielectric and chemical insulation, dry lubrication, exceptional durability, abrasion, heat resistance, and many others. Denmac coating service is complete. Services range from development and prototype assignments to long run production, coating of a vast variety of parts, both large and small. One of the most experienced and progressive firms in the field, Denmac has earned a well deserved reputation of highest quality, workmanship, and fast, dependable service. 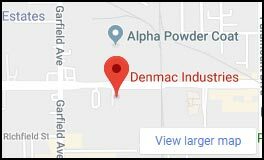 Denmac serves an impressive number of industrial and commercial accounts in the automotive, aircraft, aerospace, chemical, furniture, recreation, cookware, metal fabrication, petroleum, material handling, construction, heating, food service, water treatment, and numerous other industries.